Just like the first event, the second Fellow Event helped me a lot. There are a lot of things I learned in FE2 such as conflict transformation, managing and engaging others as well as design thinking. I am going to apply those lessons in my daily life. It is very good that I can apply all the lessons from FE2 in my workplace. At my work, I have to manage and engage both internal and external stakeholders in order to implement the projects I am working on. I need to advocate others for the new projects. I can apply the presentation skills when I conduct the training, workshop or orientation for the staff in my organization. As a human, I have personal conflict in my work and life. After I learned about conflict transformation, I’ve been inspired to work on those conflicts and I am confident that I can now manage my personal conflict. The phrase “Go Do Good” always motivates me especially when I feel that I am not doing good deeds. I’m very inspired that other Fellows already planned to implement their Go Do Good Projects such as supporting a library or helping children with education. What I learned from the Fellows is how to mobilize and encourage others to join me and Go Do Good. I will continue to do Pay It Forward Workshops and share lessons from FE2 in my community. I will also implement my Go Do Good Project before the next event starts. Nay Myo Oo lives in Sittway, Rakhine. He works as a Community Service Officer at Lutheran World Federation. 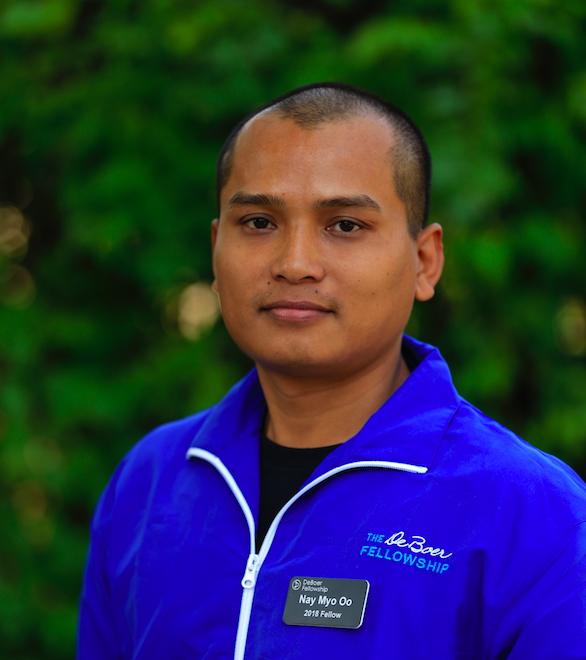 Nay Myo lives with very supportive parents and one brother. Very interesting, sharing your experience of FE make me to apply.